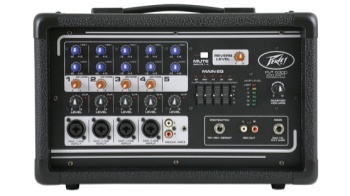 The Peavey PV 5300 is an all-in-one powered mixer, providing up to four combination XLR and 1/4" inputs using premium Peavey mic preamps, and 200 watts of peak power for crystal clear audio reproduction. The Peavey PV 5300 uses exclusive and patented features to accurately help improve tone and clarity of vocals. Our patented and revolutionary FLS® Feedback Locating System quickly and easily identifies and removes feedback. Footswitchable, built-in reverb complements the already feature-packed unit. Connect almost anything to this versatile mixer via the onboard 1/4", RCA and 1/8" mini jacks. Combination XLR and 1/4" input jack. 5-band graphic EQ with FLS®. Master mute for channels 1-4. Weight Unpacked: 14.99 lb(6.8 kg). Weight Packed: 17.00 lb(7.71 kg). Width Packed: 11.75"(29.845 cm). Height Packed: 17.75"(45.085 cm). Depth Packed: 11.5"(29.21 cm).